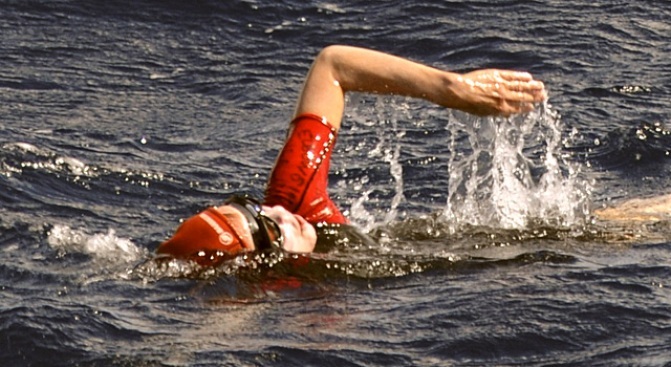 Jennifer Figge, 56, completed her record-breaking swim from the Cape Verde Islands to Trinidad. Endurance, thy name is Jennifer Figge. With all the detritus we've had to sort through in sports over the past couple of days, it's a breath of fresh air to hear a story like this one. The 56-year-old became the first woman on record to swim across the Atlantic as she touched land for the first time in almost a month. According to the AP report, Figge had the dream conquest in her head since the early 1960's during a stormy trans-Atlantic flight, and it turned into reality Thursday night when she arrived on Trinidad's Chacachacare Island (an abandoned leper colony of all places). During her taxing journey, Figge had to battle waves of up to 30 feet and strong winds, and the inclement weather forced her to veer 1,000 miles off course; she originally was supposed to swim to the Bahamas. Her longest time in the water was about eight hours. Her nourishment? That would be pasta and baked potatoes for breakfast, bottles of energy drinks -- delivered by her crew as she swam -- and at night, she dined on meat, fish and peanut butter to restock the estimated 8,000 calories she burned each day. Figge, who made the journey a decade after French swimmer Benoit Lecomte pulled off his solo trans-Atlantic swim, will continue onward from Trinidad to the British Virgin Islands before returning home to Colorado, where her Alaskan Malamute waits. "My dog doesn't know where I am," she told the AP. "It's time for me to get back home to Hank."